[Mountain Town Music Fest in River Run Village. Photo: keystonefestivals.com] Can you think of a better way to spend the summer than attending weekend festivals packed with live entertainment, food, beer, and interactive activities? 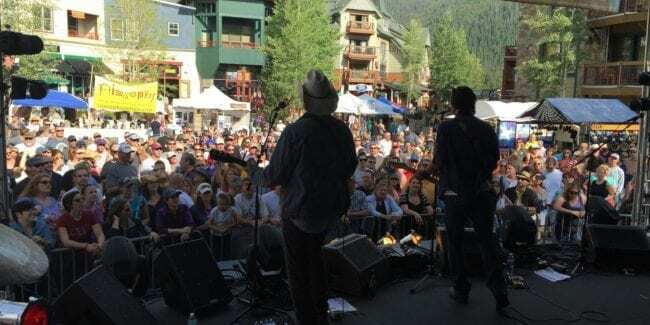 If that’s the kind of summer vibe you want, then head out to Keystone’s annual Mountain Town Music Festival. The Mountain Town Music Festival will have their 6th year celebration on August 17th, 2019 at the River Run Village in Keystone. The festival starts with a Mountain Town kick off concert, followed by a long list of activities. Aside from music that will take place on the River Run Main Stage, there’s also a KidsZone area where kids can get their face painted. Festival vendors will be all over the place offering food, beer, Mountain Town merchandise, and fresh produce from local farmers. Before the night ends and everyone goes home, there will be a spectacular fireworks display over the River Run Village to cap off the night.